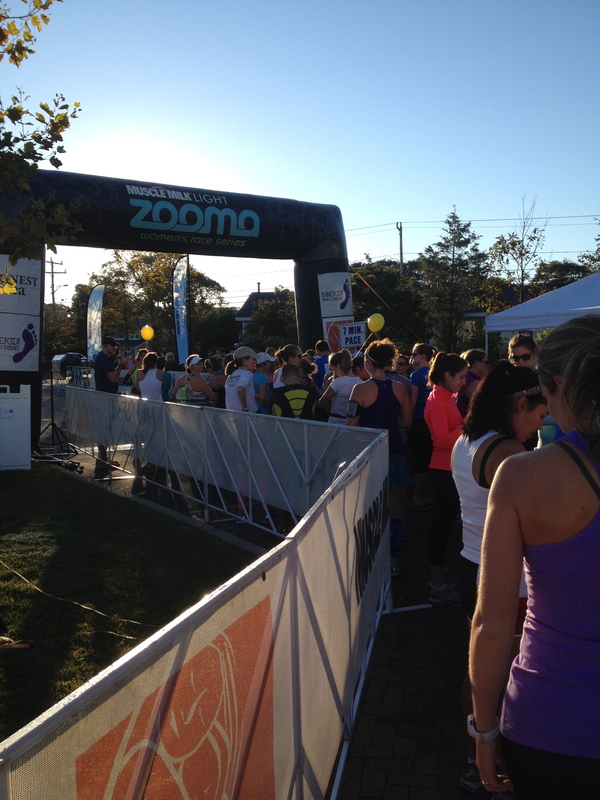 This past weekend my friend Kaela and I ran in the Zooma Half Marathon in Falmouth which is on Cape Cod, MA. AND KILLED IT. 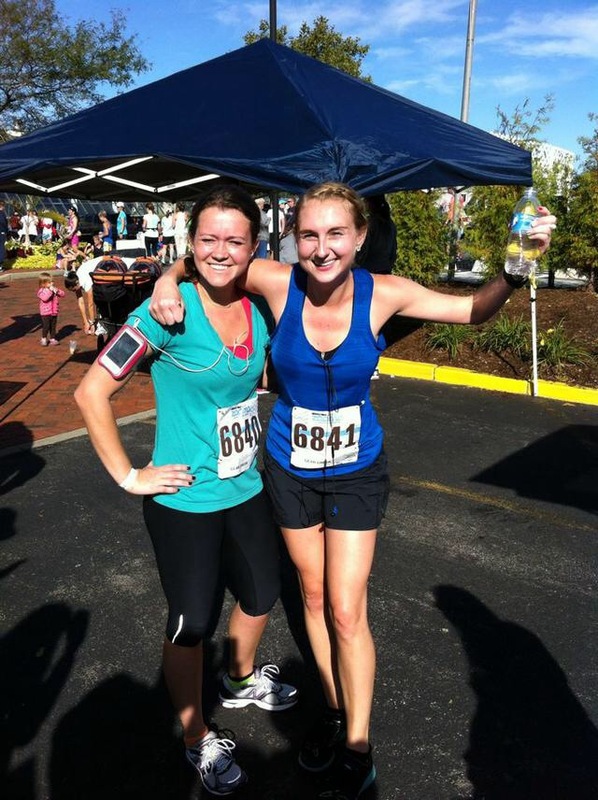 We signed up for the run back in May with the idea that it would be a great way to start whipping myself into shape for my wedding and just a great goal to have. Kaela hadn’t done one before and after finishing my first, I couldn’t encourage her enough to try it. Kaela had jumped right into training and was asking me to run 8 miles with her on the Fourth of July. I wasn’t there yet. Even though I signed up with the goal of hitting the 2 hour mark, I still hadn’t started training. A casual run here and there wasn’t going to get me to 13. It wasn’t until the middle of August that I looked at a calendar and realized that I needed to REALLY get serious about it, and change my goal to finishing without dying. It was just enough weeks to hit the 13 miles in stride. But, the farthest I ended up running in my training was 9. 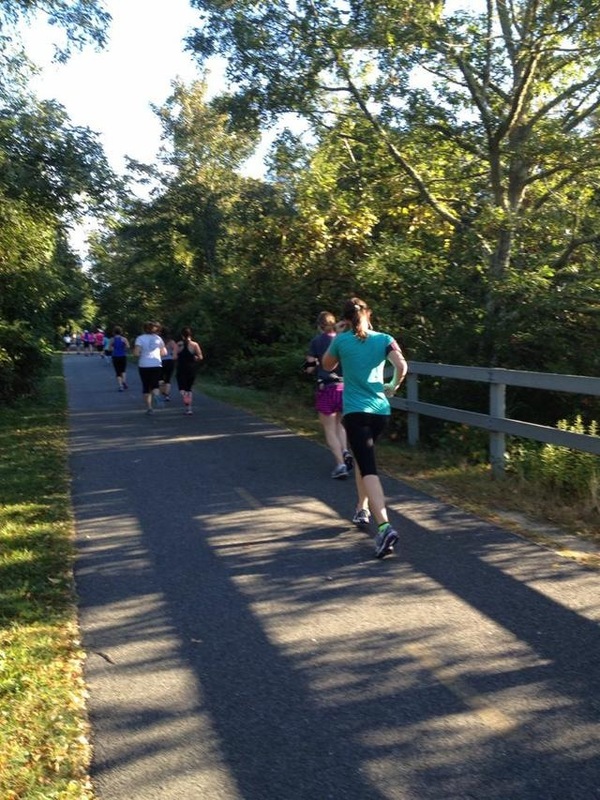 I ended up getting myself comfortable with running that 9 miles but I was terrified the night before the race knowing that I might not be as prepared as I wanted to be. My ultimate fear, letting Kaela down because this was a race that we wanted to do TOGETHER. 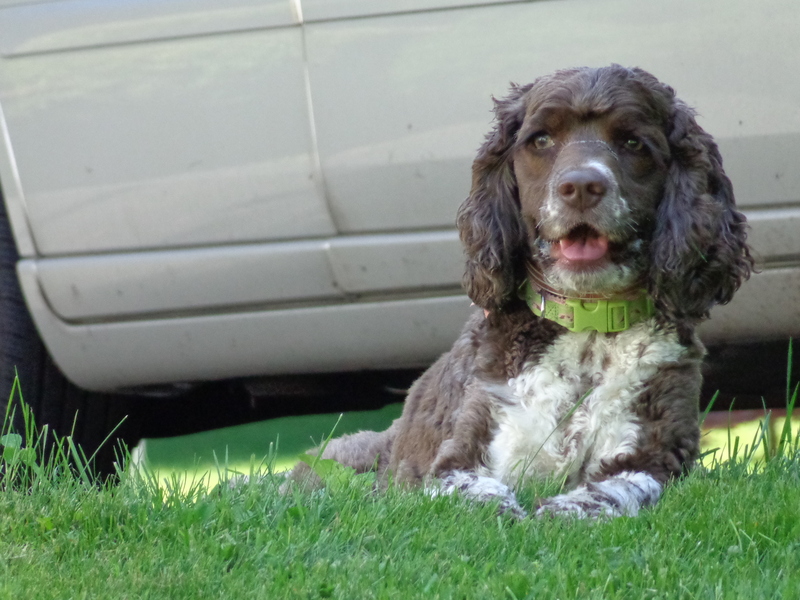 That was really what got me off the couch some days, knowing she was training so hard. 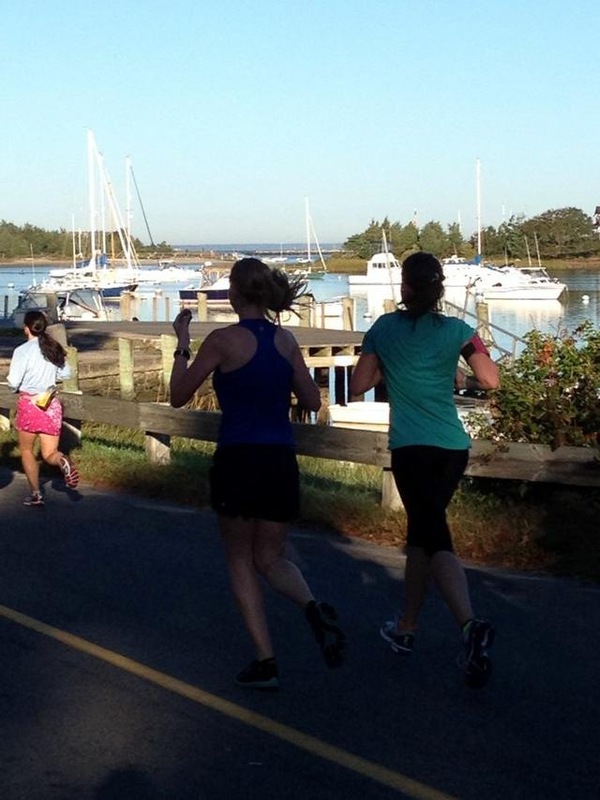 The race started at 7:30 at the Seacrest Beach Resort in Falmouth. I was actually really surprised at how much smaller this event was in comparison to all of the other races I’ve done. I remember how motivating all of the other people running were and was actually a bit nervous about having a smaller group of people going. We started out at a good pace, meaning FAST. I would guess an 8 minute mile. After about 3 miles, I slowed and let Kaela power on. 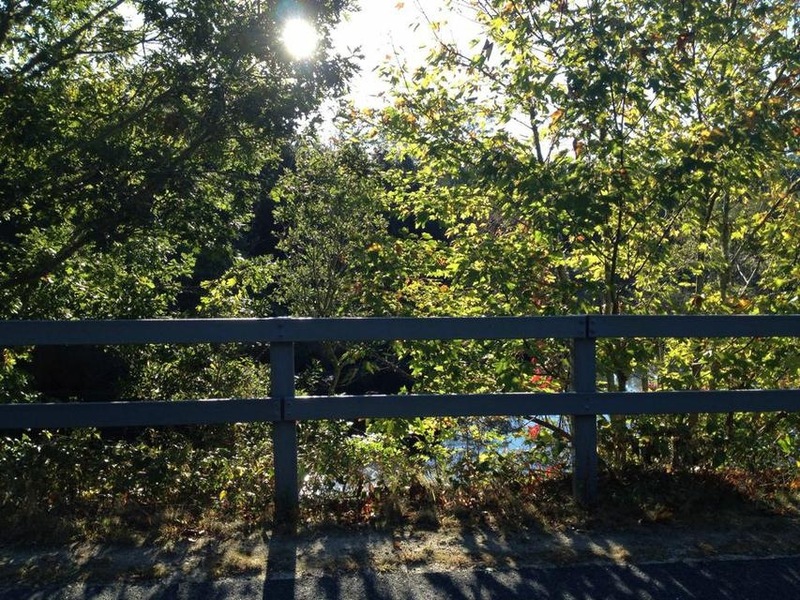 Throughout the race, it was hard NOT to notice all of the beautiful scenery on the Cape. I wish I could have just stopped and snapped pictures of the pretty views of the Ocean and the bogs. It was seriously breathtaking at some points. But nothing really compared to having a HUGE cheering section. 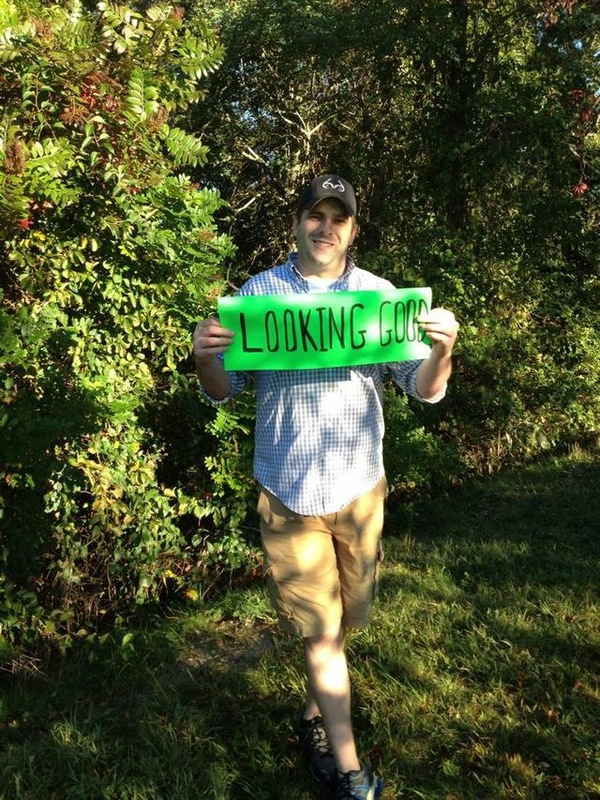 Brent folded his sign to cheer on the other girls. 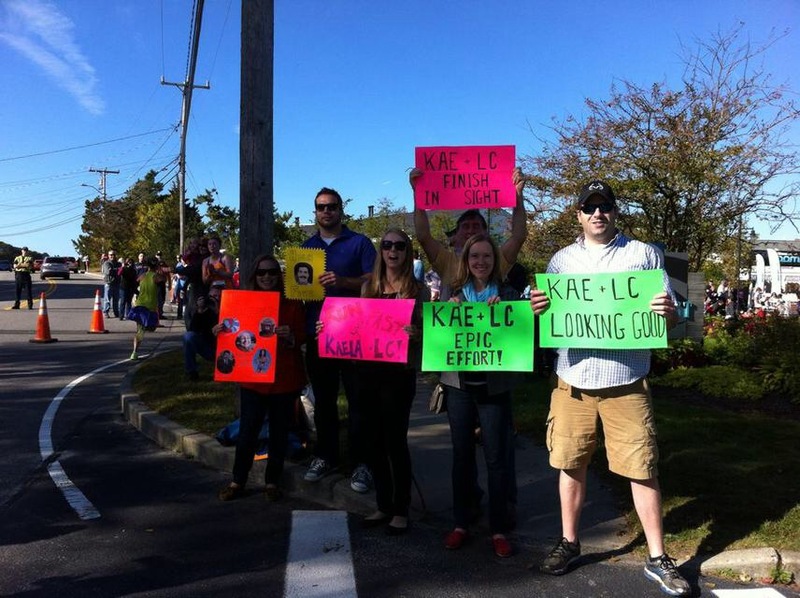 Brent, our friends and family were waiting on the course at several different spots with huge signs and cheers. It was so much fun to run and wonder where they were going to end up next. Maggie said she had felt like a treasure hunter or something. Running from spot to spot on the map and trying to time it perfectly with us running. Apparently they never had to wait long for us to reach them at their new post. So much fun. There was a HUGE hill at the end of the course and once you hit the top you just coasted right down into the finish line. I thought it was going to be really difficult to get over the hill but I actually loved the fact that there was the huge hill. 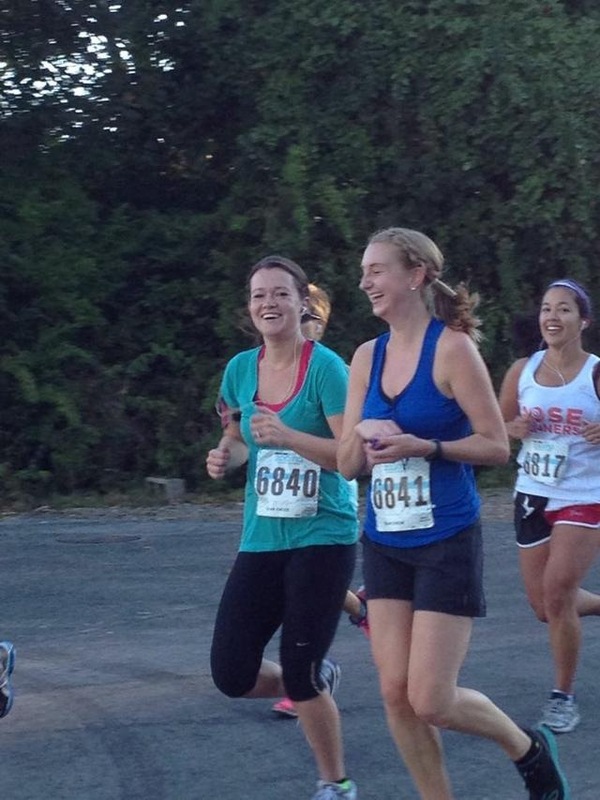 It made the last little bit extremely enjoyable just sprinting into the finish line downhill. AWESOME. I ended up finishing in 2 hours and 3 minutes. 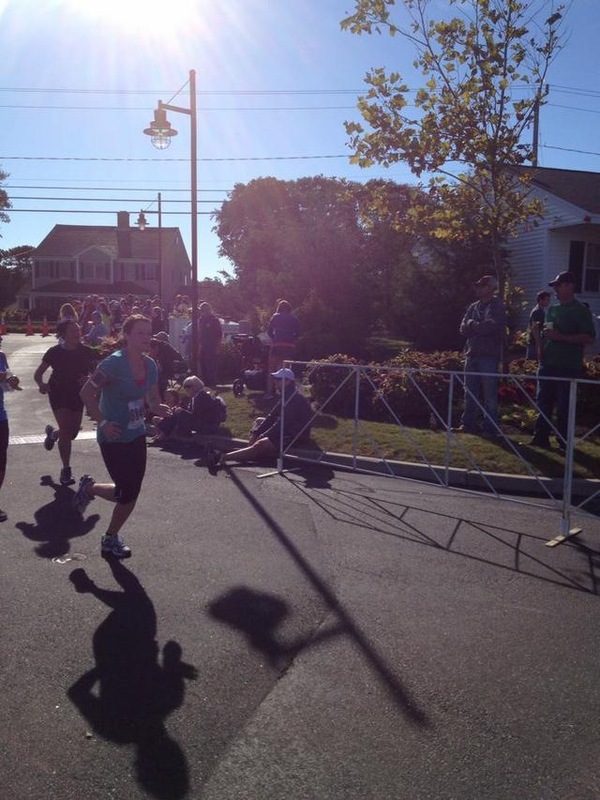 When I turned the corner into the finish line I saw the time and was immediately excited at the time, then it set in…I missed it by 3 minutes. 3 MINUTES. I was so proud of myself and so excited but at the same time I just couldn’t believe I missed it by 3 MINUTES. 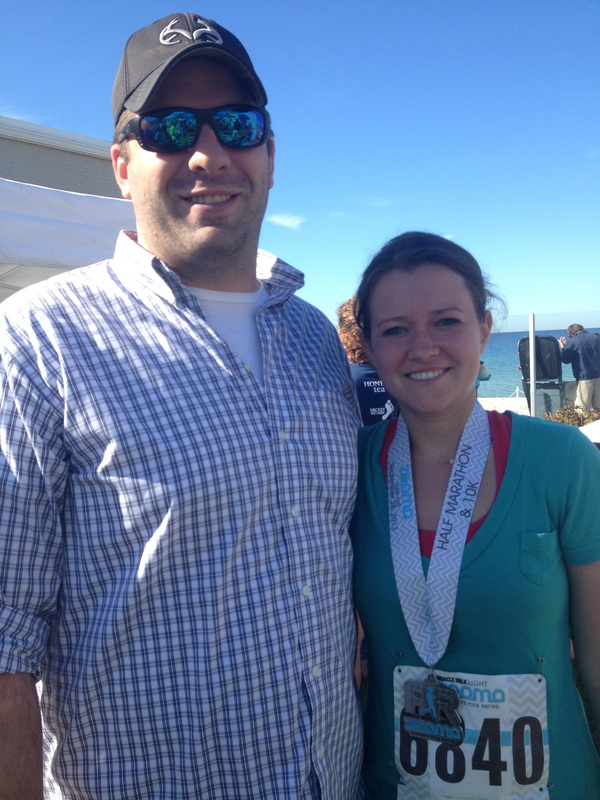 Kaela finished in 1 hour and 53 minutes. Just amazing. I can’t believe how well she did and she really deserved it. She worked so hard to finish with a great time. 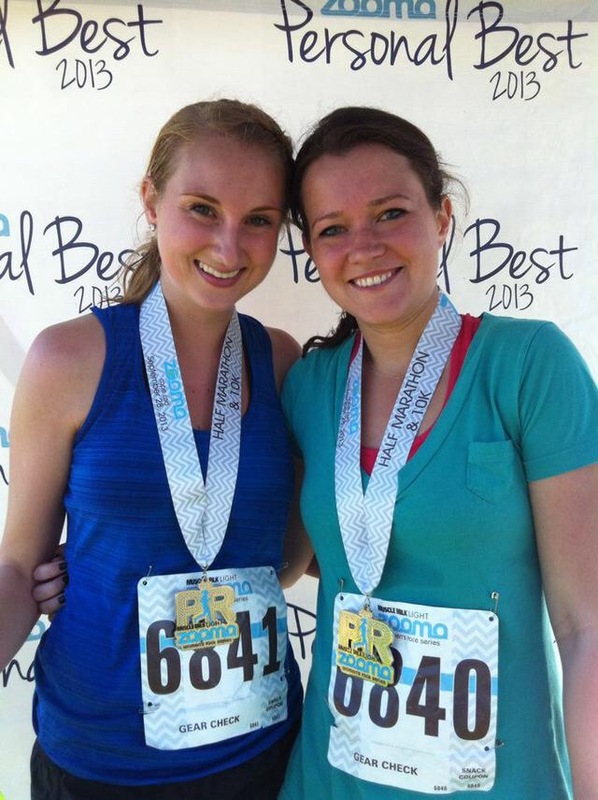 Especially for her first half marathon, which I’m positive won’t be her last. Afterwards, we just took in the view from the resort and relished in our accomplishment. Obviously snapped a few pictures. It was just such a great feeling. 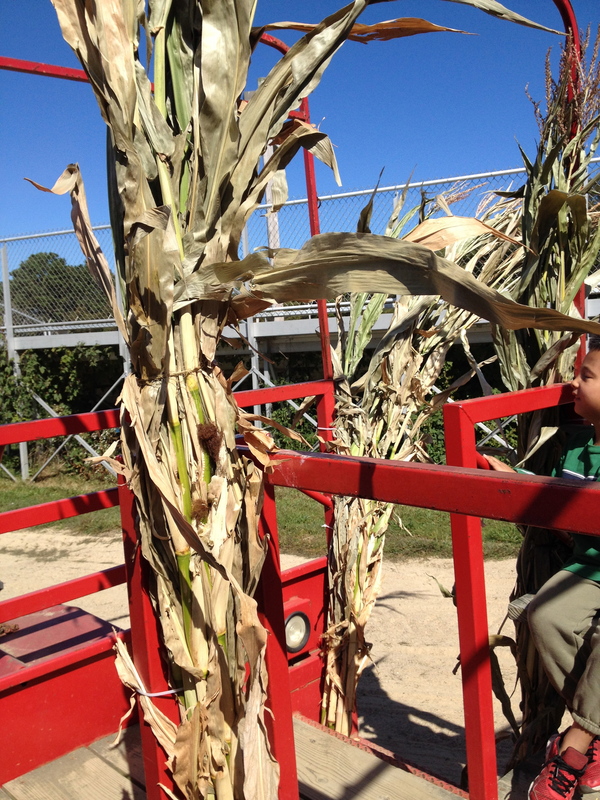 We all headed straight over to the fairgrounds to walk around the fair and enjoy the weather. 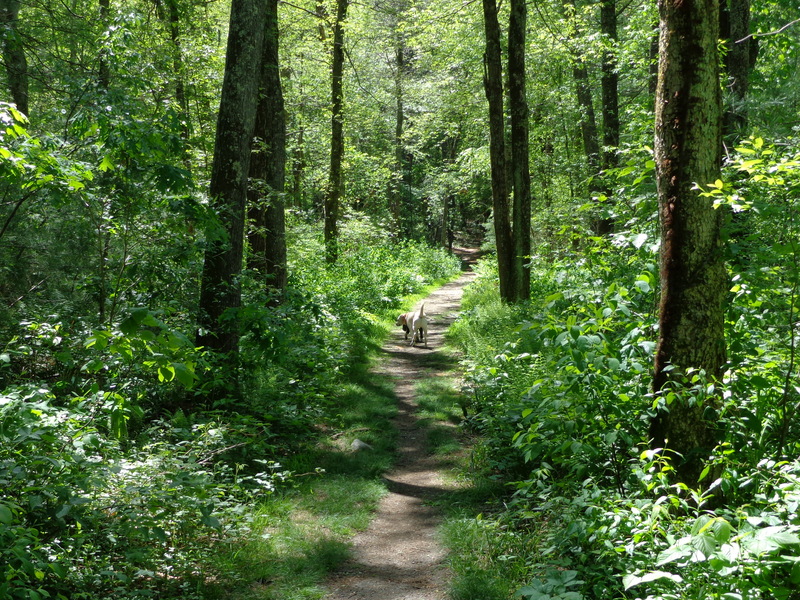 It was also a great way to stretch out our legs and keep moving. Everything fall finally made it’s way out and it was just fun to be around. Overall, the run was just amazing. As a medal, they gave us these cute running necklaces, which was a nice change of pace from the traditional medals. You can wear them any day and remember how hard you worked for that accomplishment. I have been wearing mine since the race and every time I notice it, it makes me feel accomplished. We are already looking for our next one. 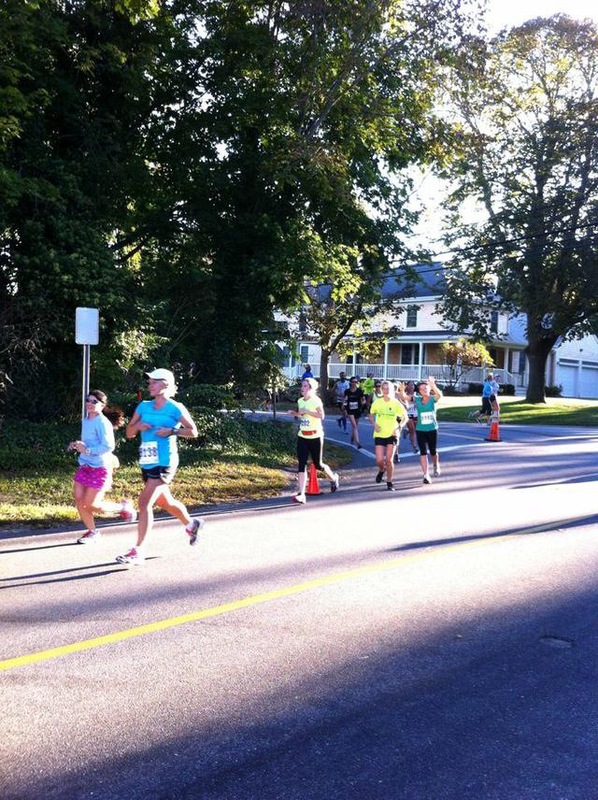 This entry was posted in Cape Cod, Half Marathon Training, Races, Random and tagged Cape Cod, Half Marathon, training, Zooma on October 10, 2013 by Sizzle Food. 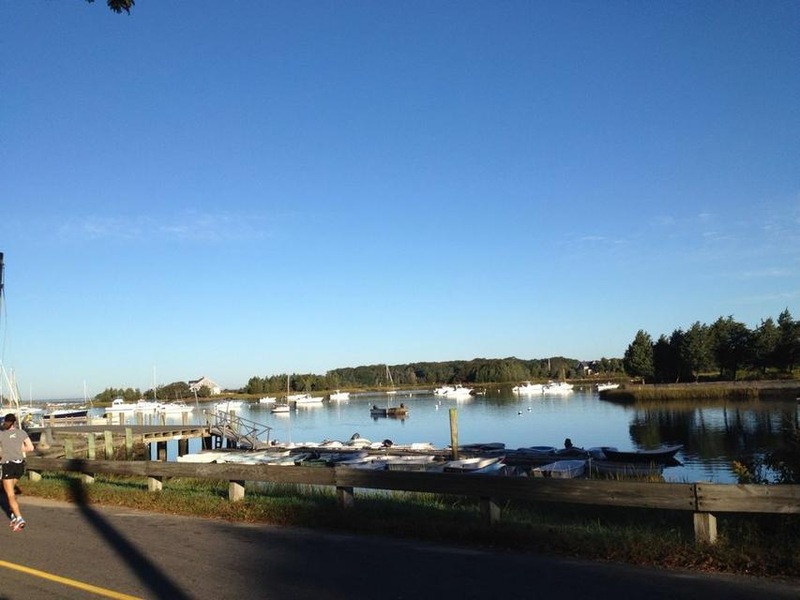 Yesterday, I woke up early on Cape Cod and packed everything up to head back to the main land in hopes that I would miss all the traffic and to have a full day to get some things done. 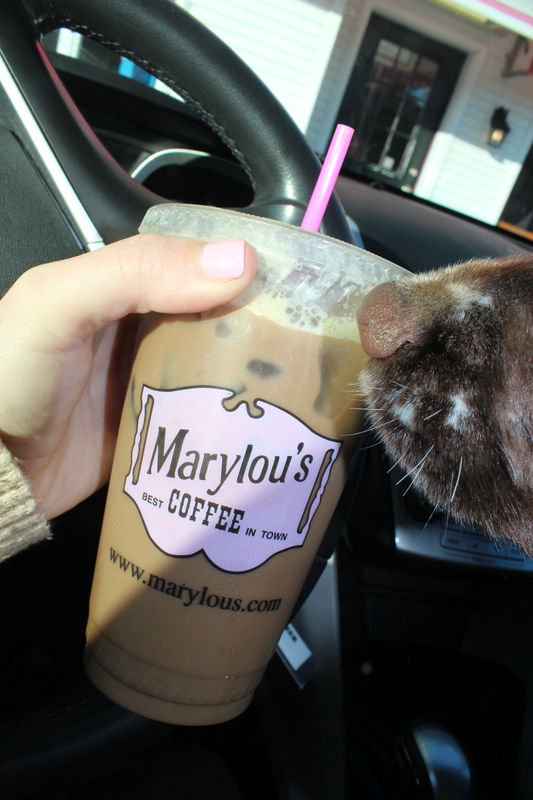 But, I didn’t miss the chance to try out a new Mary Lou’s Coffee. This time, I tried the Girl Scout Cookie Coffee, which tastes like a thin mint. It was a lot sweeter than I expected, and I didn’t have them add any sugar or milk to it. Next time, I’m sticking to my Peanut Butter Wonderful. 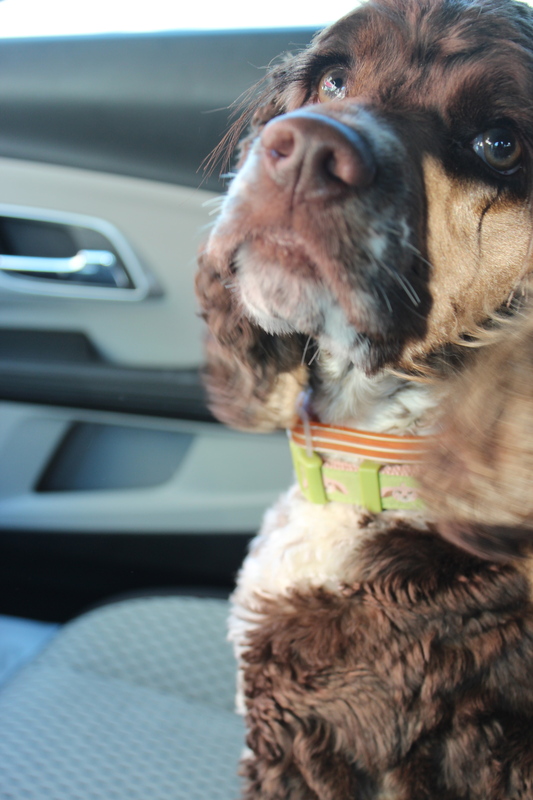 Oreo didn’t really mind the flavor change…she just wanted a taste and really had her begging eyes going. 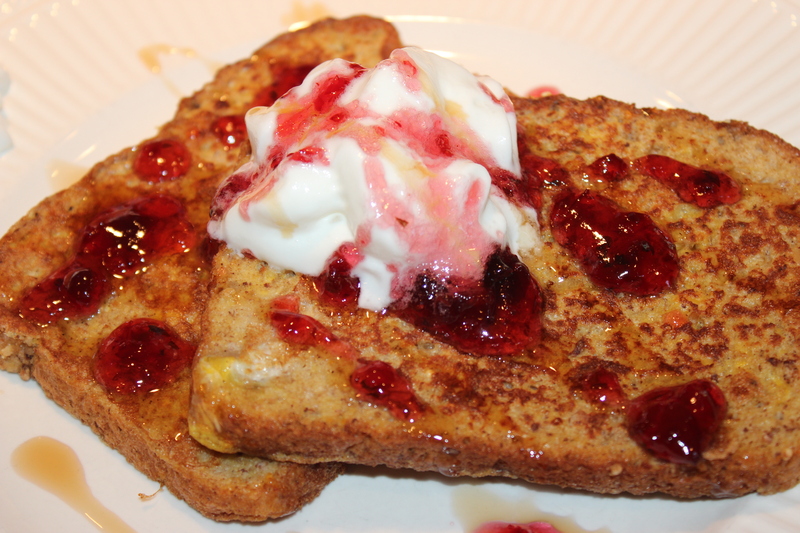 When I got back to the house, I unpacked and started to whip up some french toast for the holiday. The refrigerator died while we were away so ingredients were at a low. They were also squished into the smaller fridge in the basement, which made searching for ingredients a bit of a workout. 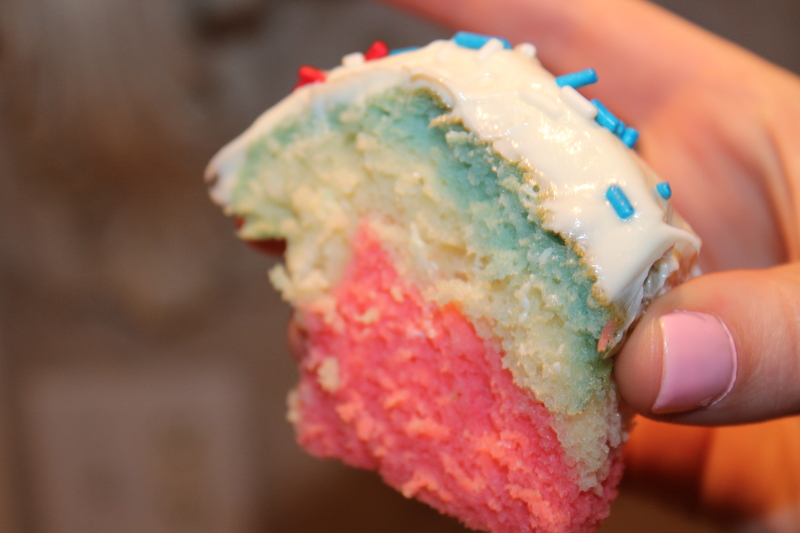 I was hoping to come up with something a little red, white and blue…but couldn’t find the blue portion. 1. 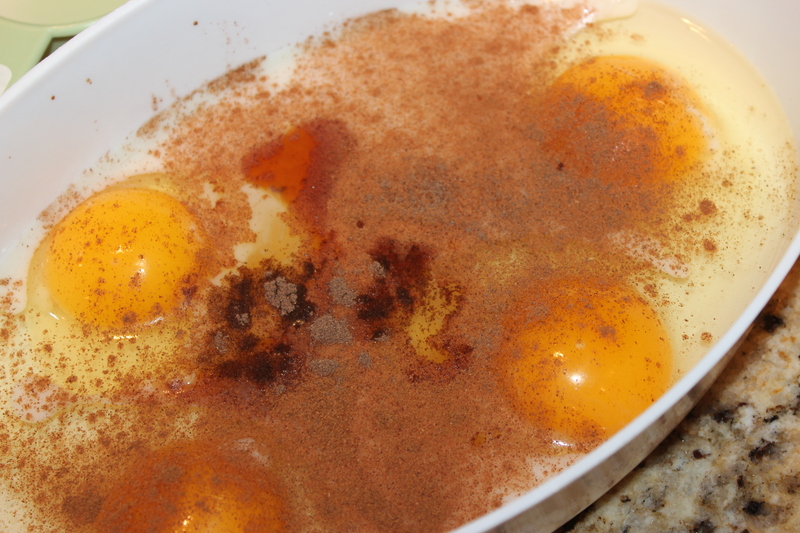 In an open dish, mix up the eggs, cinnamon, almond milk, allspice, and vanilla. Dip the bread into the mix, covering it on both sides. 2. 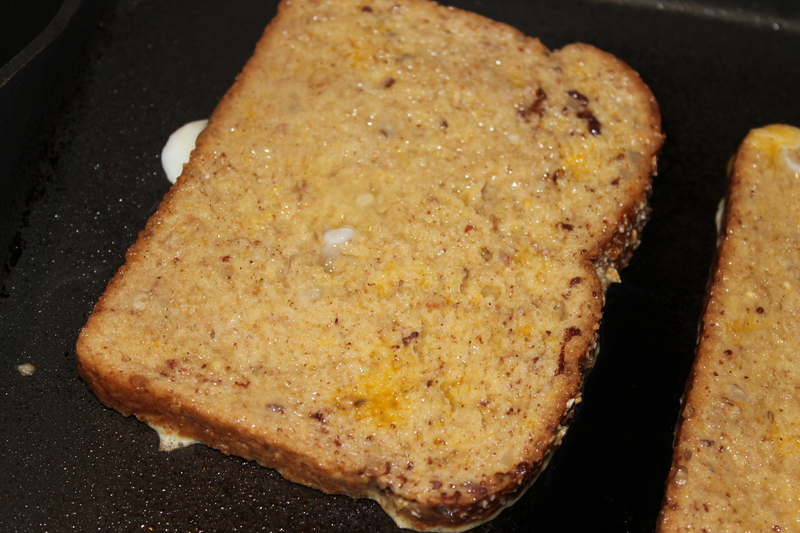 Heat up the skillet to medium heat and cook the toast on both sides for about 2-3 minutes, or until golden brown. 3. Heat up the tablespoon of Cape Cod Jam for 3o seconds (It is a local jam made of cranberries and basil, substitute it for any cranberry based jam). 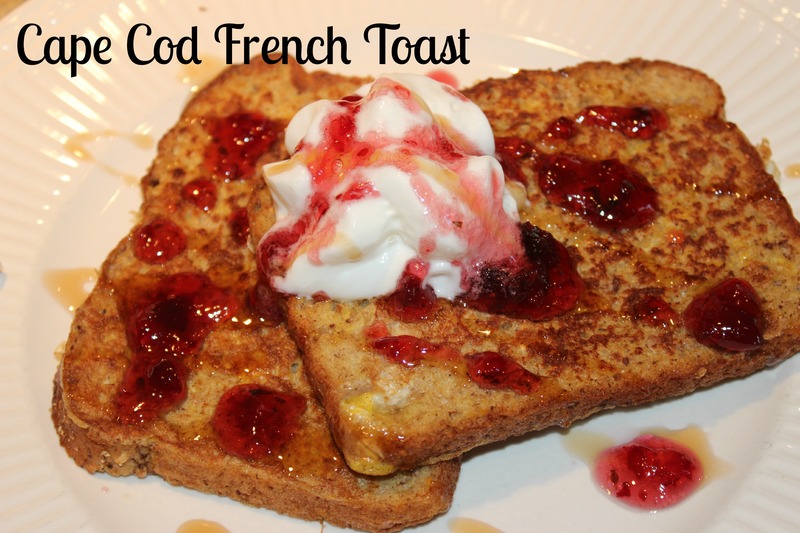 Drizzle it over the french toast and top with whipped cream if desired. ENJOY! 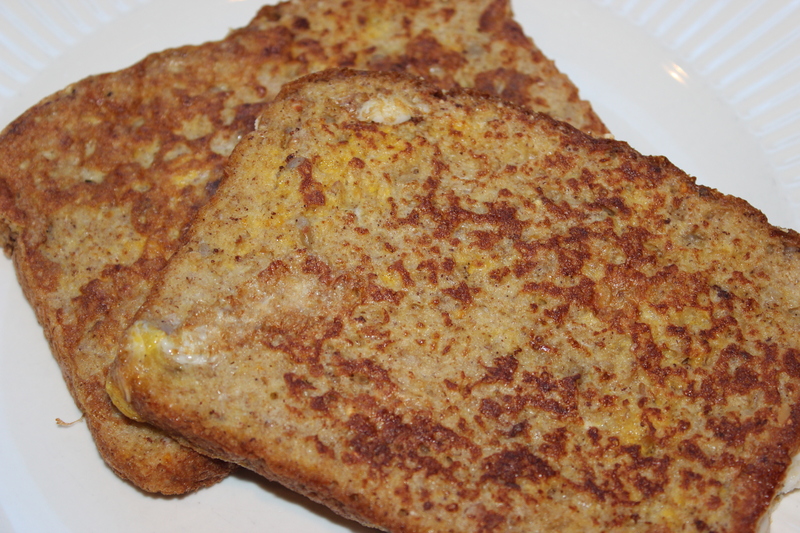 The small bits of nuts that are in the bread added a lot of texture to the french toast that really made it fantastic. 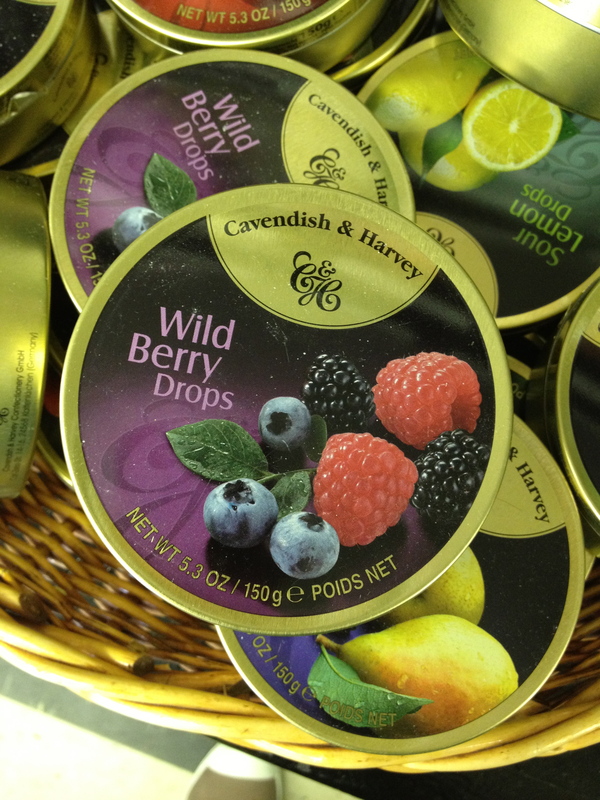 The Cape Cod Jam isn’t too sweet and really balanced the whole thing out. I was a little nervous about the basil portion of it but it turned out great. Maggie was heading to a BBQ with some friends and she was responsible for bringing dessert. 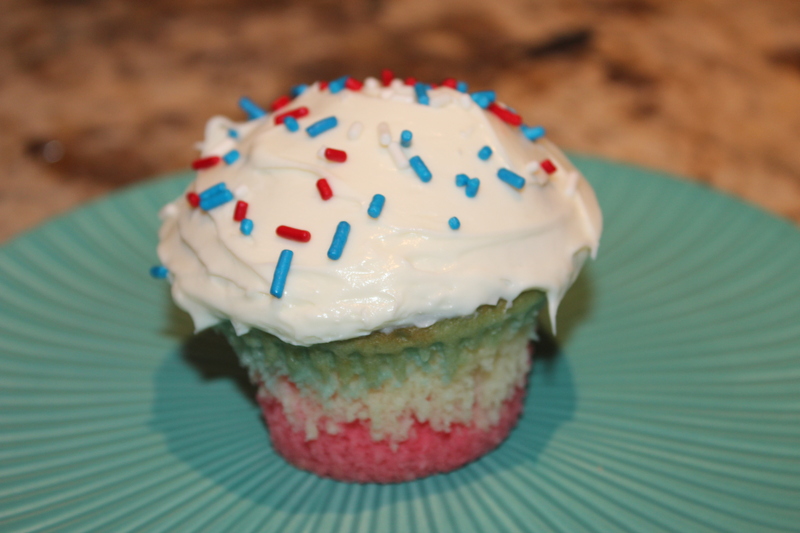 We both headed to the supermarket to pick out some fun sweets but ended up coming home with a little project…Red, White and Blue Cupcakes. Super easy but super festive! 1. 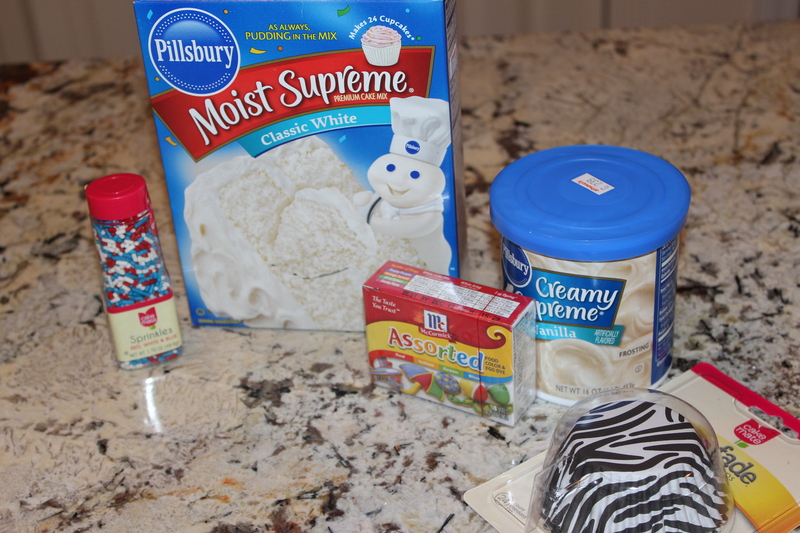 Just mix up the cupcakes according to the box directions. After it is well stirred, separate the mix into three even bowls. 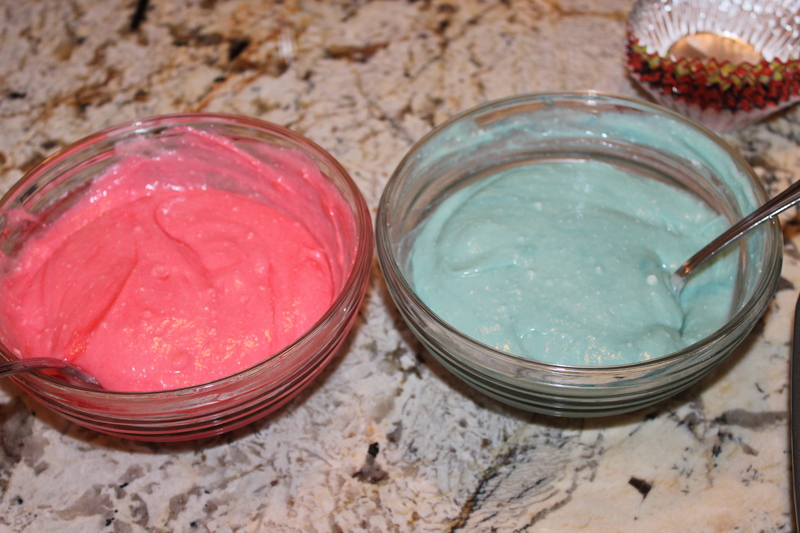 Add red and blue food coloring until you get the color you like. 2. 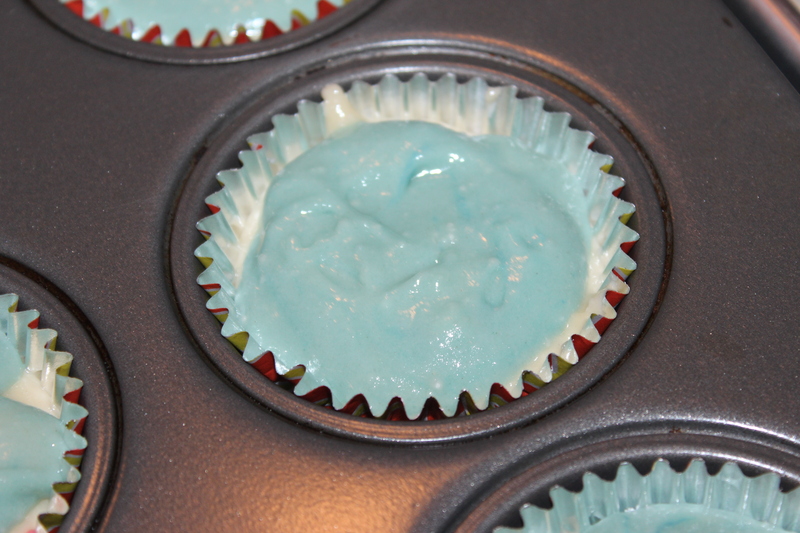 In the cupcake pan, with the covers, first put a spoonful of red, then white, then blue batter. Bake according to the directions on the box. 3. When the cupcakes are cool, frost it and top them off with the sprinkles! Finito! 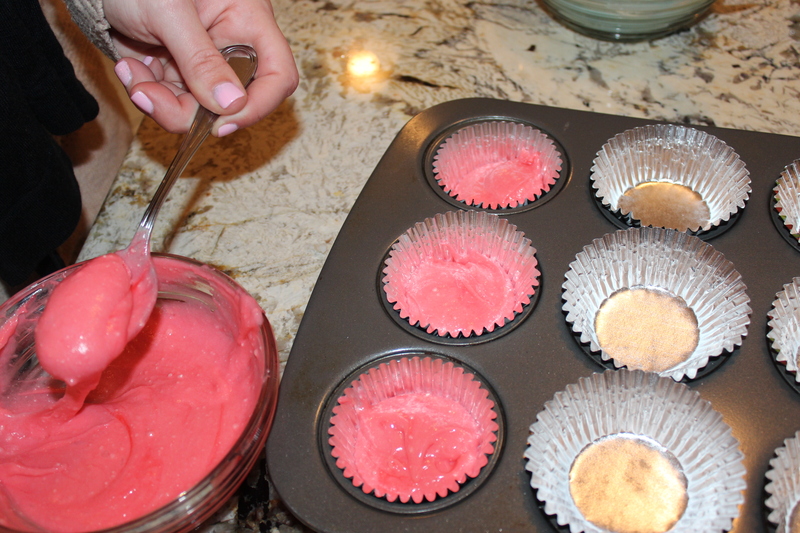 Maggie and I filled them up a bit high…and ended up making 12 cupcakes out of the batter that calls for 24…Whoops. They were delicious though and just a fun twist on the traditional cupcakes. You could really do this for any holiday. Think green! for St Pattys day. Haha. Brent and I ended up hiking to work off the french toast. 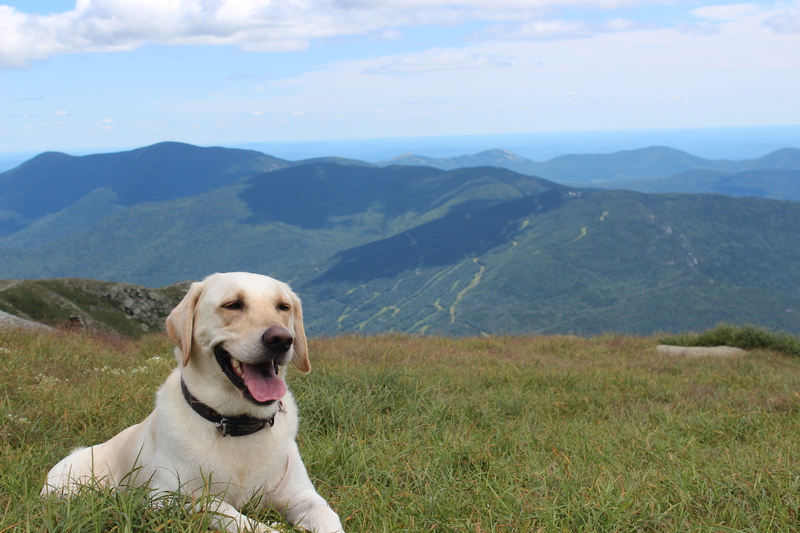 Brent hadn’t been to Noon Hill before and it’s a nice little hike to a fairly high summit. The puppies were sufficiently tired and ready for a nap when we got back. It’s such a nice little hike. The map says it is only 1.3 miles, but I would disagree. I’m leaning towards more like 2 miles. What is your favorite holiday dessert?? This entry was posted in Breakfast, Dessert! 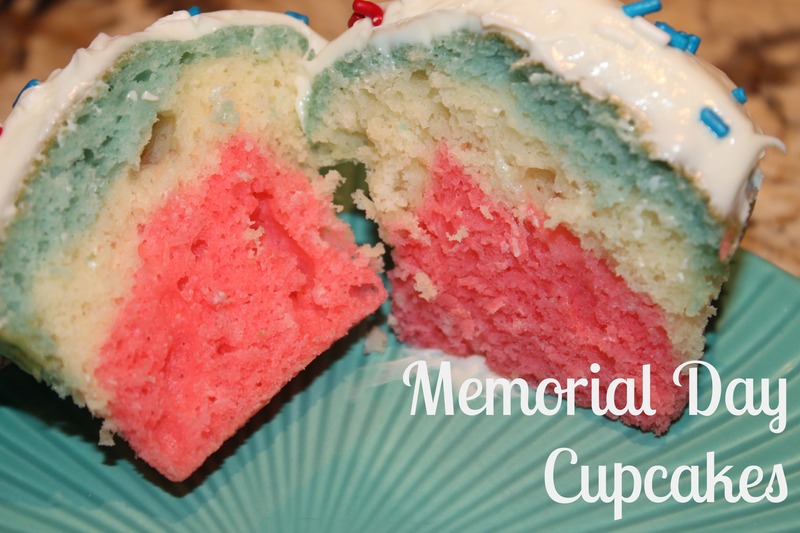 and tagged blue, Breakfast, Cape Cod, Cupcakes, fourth, french, Holiday, july, Memorial Day, Red, Toast, white on May 28, 2013 by Sizzle Food. Welcome to the Long Weekend! I have been DYING for a long weekend just to NOT think about work. Since I started my new job I haven’t had a day off and I really just wanted a few days to put the work and the emails aside to do whatever I felt like. 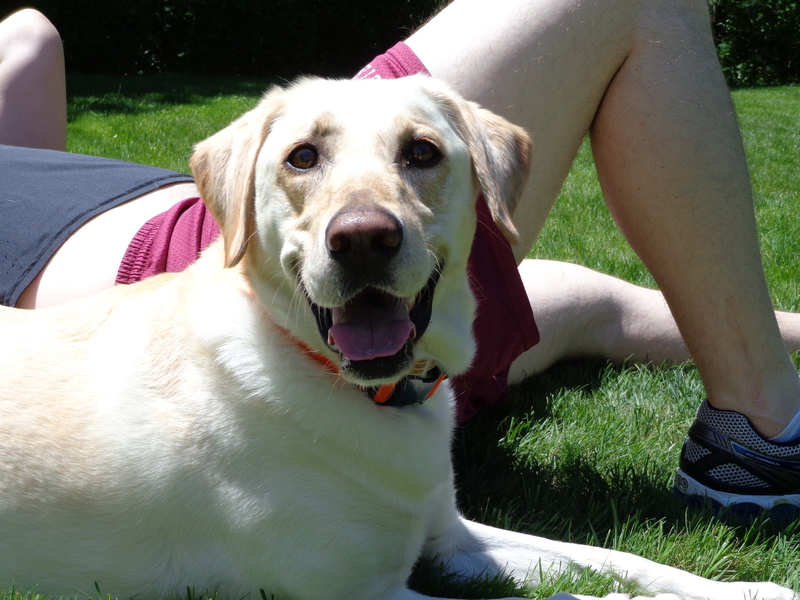 For Memorial Day weekend, I headed down to Cape Cod to stay at my parents house. I actually drove down on Thursday night and went to a few meetings on Friday to avoid traffic. Yesterday, I woke up around 7 and headed outside to let Oreo and Bacon do their thing when I spotted THIS guy hanging around the street. HOW COOL IS HE?! 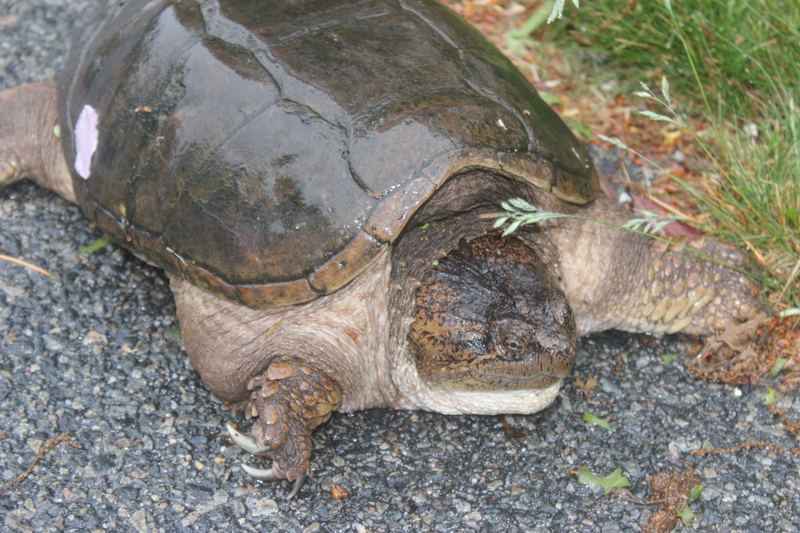 I have seen a few turtles before, but this was by far the largest that I have seen just out for a stroll. Bacon ran over to it clearly thinking it was a rock. But upon further investigation, ie sniffing, he discovered it was alive. He jumped backwards three feet and just glared at it in curiosity. Oreo…still thought it was a rock. Besides the large turtle roaming around, they had a fantastic time chasing the rabbits that were trying get in a morning breakfast of clovers. 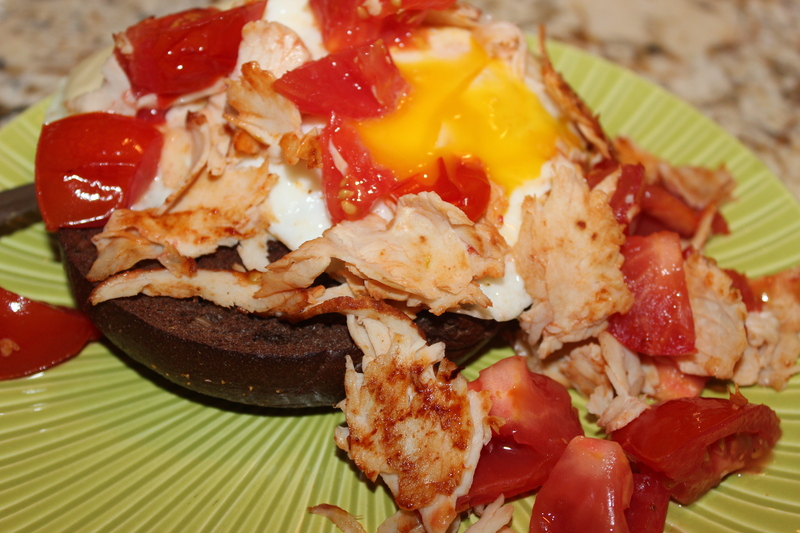 For breakfast, I whipped up an egg sandwich deal on a pumpernickel bagel. I’m trying to cut back a bit on the amount of bread that I’m eating because I recently realized that all I eat is really carbs and carbs. So, I toasted up half a bagel, cooked 2 eggs over hard, seasoned them with some cajun seasoning and melted a half a slice of cheese on both. With the pan still hot, I chopped up two small tomatoes and warmed them up with bits of turkey. Threw the tomatoes and turkey on top and BAM! Yummy! After eating and relaxing a bit more. 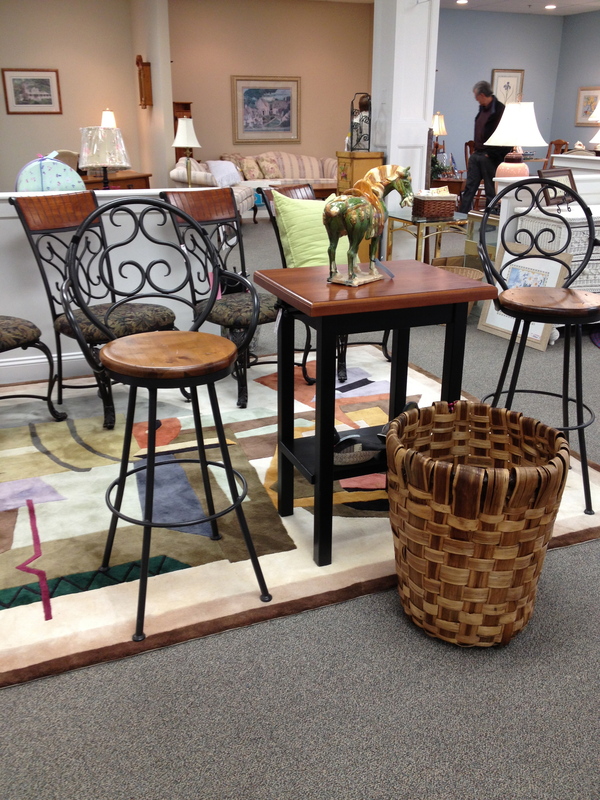 We headed out to check out some of the consignment shops that are in the area. I had heard that they were actually quite good and you can find some pretty unique things at very low prices. I was actually really surprised how many there were once you started looking…and the size on them! You could really find anything you wanted at these shops and pay much less than going to retail stores. I was particularly interested in some of the furniture. They had a whole wall of Jelly Bellies that you could just pick out the flavors that you wanted. Such a great idea. We had so much fun just walking about and taking notice of some of the oldies but goodies that you just don’t see anymore. 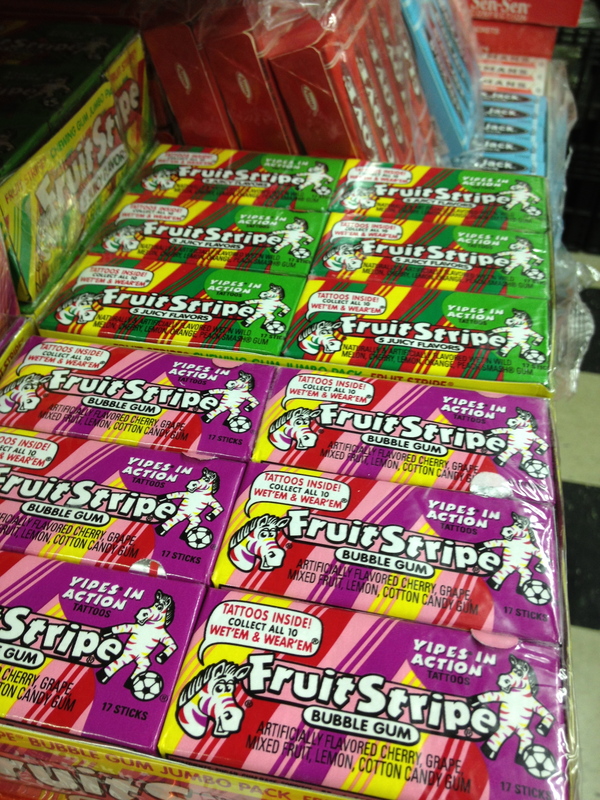 My favorite throw back were the Fruit Strip Gum. The gum was good…it lost it’s flavor fairly quickly but the best part were the tattoos that you could put on your tongue! Who remembers that?! 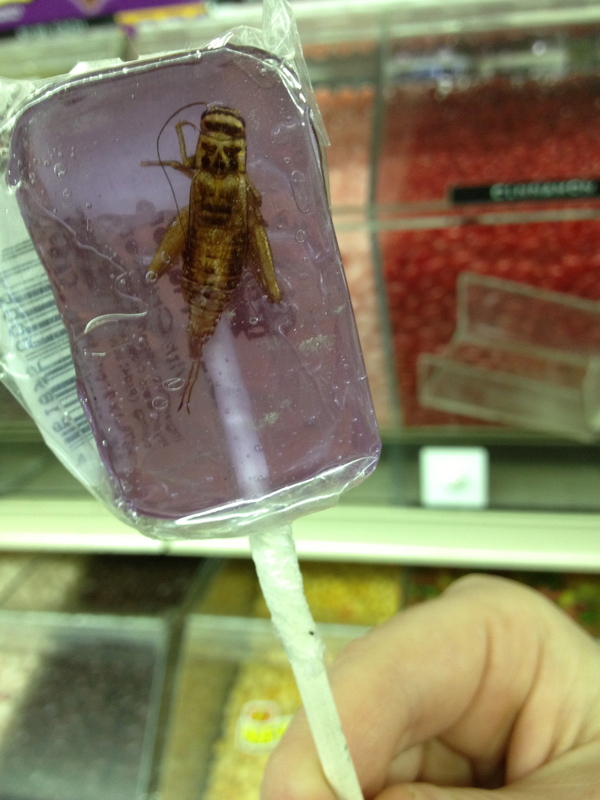 Anyone up for a cricket in their lollipop?! I ended up walking out with some chocolate covered espresso beans and enjoyed a few on the ride home. They are one of my favorite treats. After a day of walking around town, Brent and I headed to DJs Pub, which I had heard had FANTASTIC wings that you just had to try. Who can resist. We got there at the start of the second period of the Bruins game last night…and that was a poor choice. We waited for a while in the doorway with a few other people. And after around 20 minutes of waiting, a table for 6 cleared. 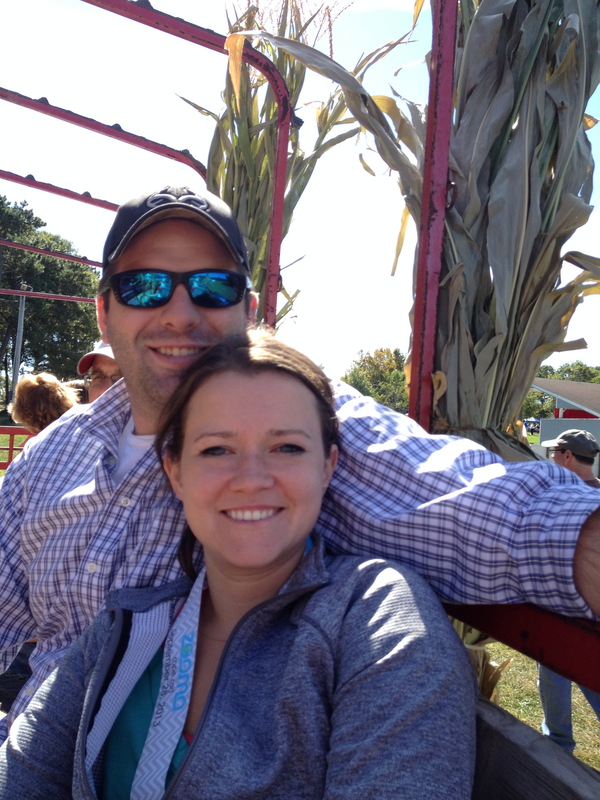 With several groups of twos waiting, we decided to sit down with another couple. 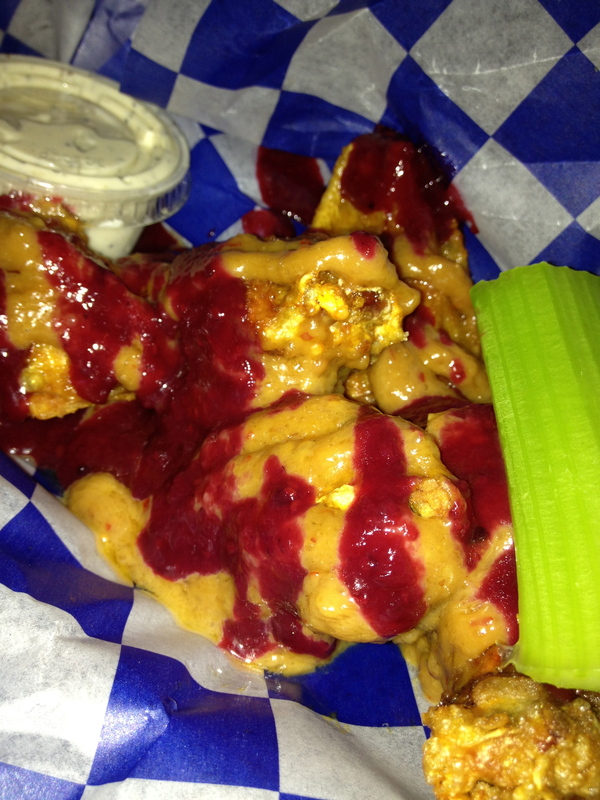 Immediately, the PEANUT BUTTER AND JELLY WINGS jumped off the menu at me. Now, that WAS my favorite sandwich when I was little, but I don’t know about putting that combo on a wing. So…we had to try it. Yes. That is peanut butter and jelly smothering those wings. And I have to say…it was different but really good! The peanut butter had a little spice to it, which really made the flavor. We tried the buffalo as well, but they weren’t as notable as the PB and J. Next time, perhaps a garlic?! 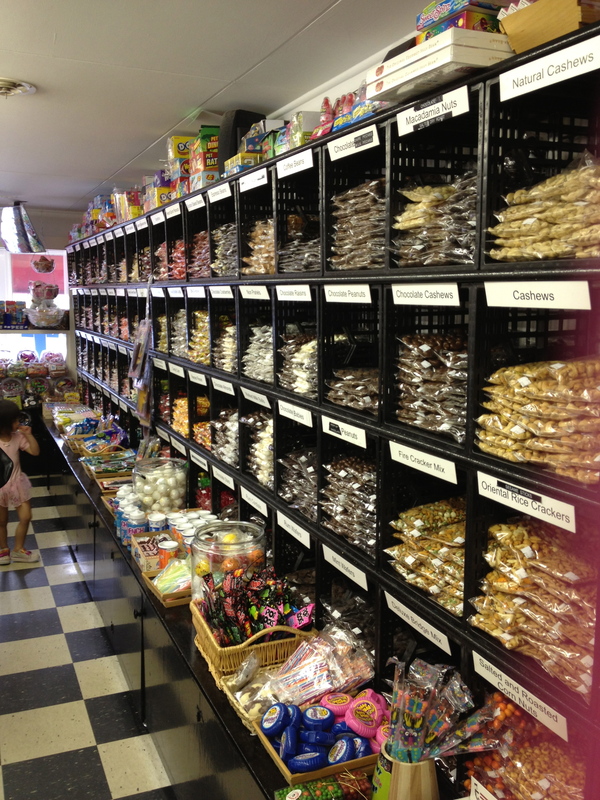 What was your favorite candy growing up?? This entry was posted in Breakfast, Cape Cod, Random and tagged Bagel, Breakfast, Cape Cod, Easy, Egg, Fast, Peanut Butter and Jelly Wings, restaurants, Tomato, Wings on May 26, 2013 by Sizzle Food. This past week, while in Boston, a few of our friends from Orlando came up for a few days to join us. They had NEVER been north of DC. And as many people know, that is not even close to the north. SImple things like a basement, or a tunnel were amazing to them. 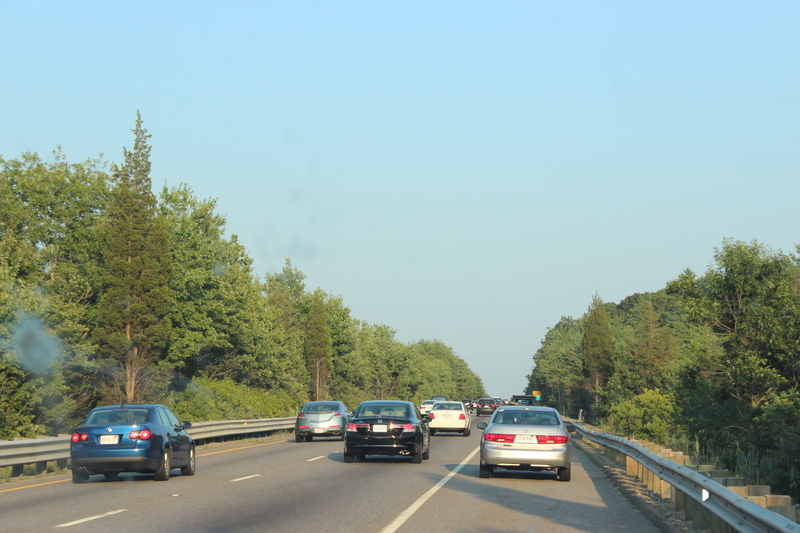 I think my favorite “OH MY GOD” moment was the first drive out of Boston down to the cape. If you aren’t form the area, you have no idea that at rush hour, they open up the breakdown lanes for travel. So you simply just drive onto the highway and you can keep on straight, just ignoring the merging lines painted right in front of you. I did just that, knowing that I would freak the out a bit. 🙂 I know. Not nice. Needless to say, they freaked out. I loved it. I took them on the freedom trail, which is a must do if you have never been to Boston. It is a really great way to see a lot of Boston in a short amount of time and to hear all about the history of the area. 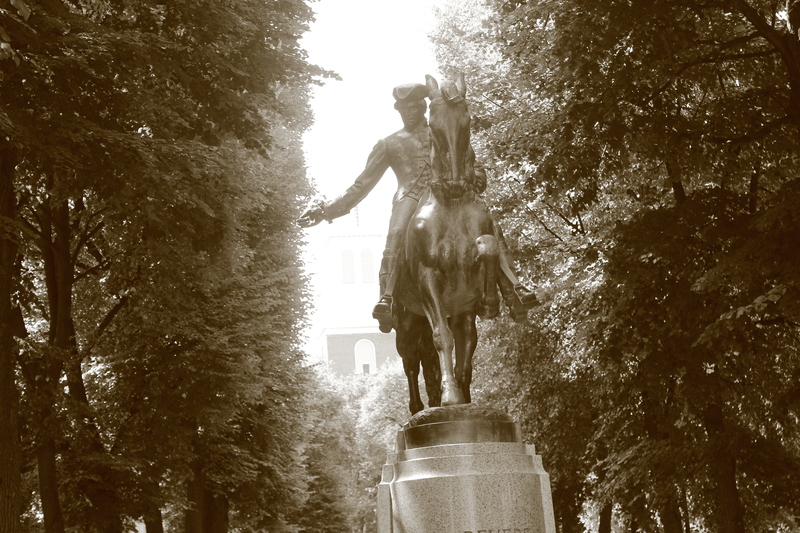 This is a picture of Paul Revere outside the Old North Church. Went to a Red Sox Game, OBVIOUSLY. 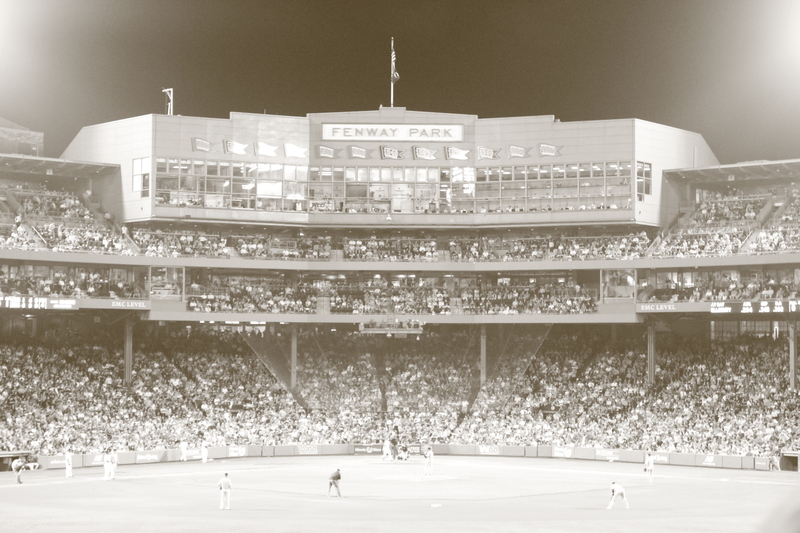 You can’t see Boston without experiencing Fenway. (Even if you aren’t a sox fan, it really is a must do). Besides all the best tourist spots to go on Cape Cod and in Boston, I decided to take them one other place. MOUNT WASHINGTON. 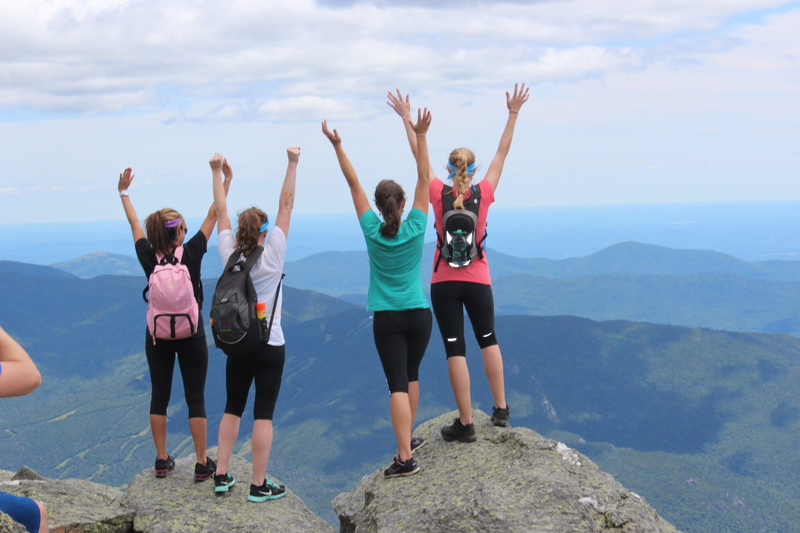 Now, if you don’t know, Mt Washington is the highest peak east of the Mississppi. 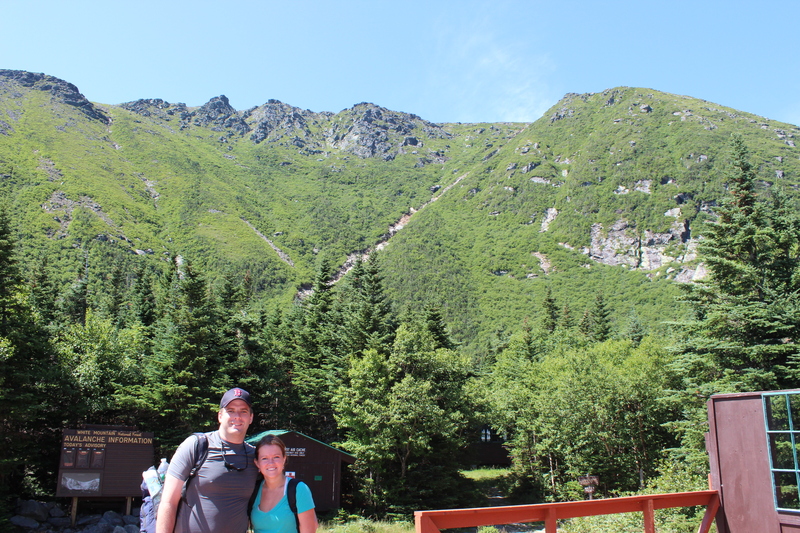 Tuckerman’s Ravine, which is the trail we took, is a 4.2 mile hike and you climb over 4,000 feet in elevation during those 4 miles. It is also known for it’s terrible weather at the peak. The day before we climbed the mountain, it was 40 degrees with 51 mile an hour winds. It felt like 30. When I told our friends that it would be cold at the top, it was hard for them to even process. They brought a thin sweatshirt each. I gave them some heartier ones to wear at the top. This is me and Brent at the half way mark. 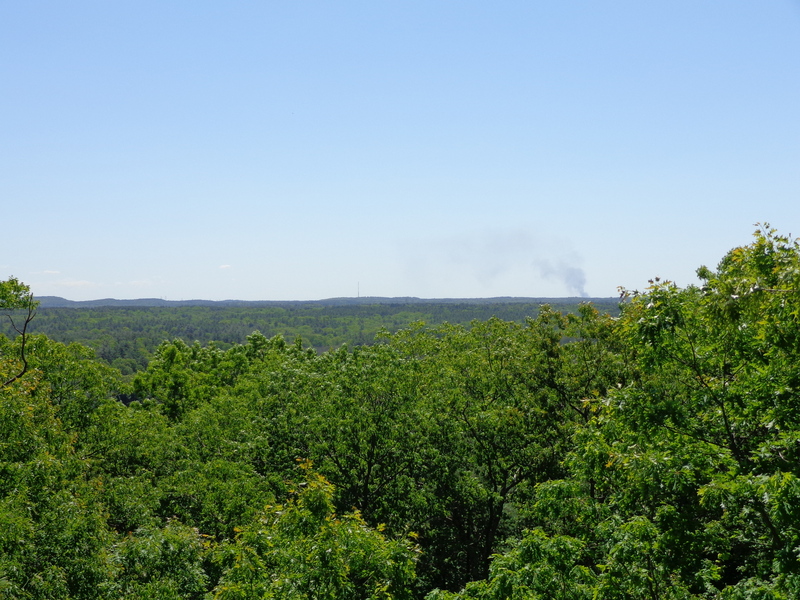 It is only 1.8 miles to the top of that guy. The climb was definitely a challenge, as you would expect. There were definitely looks of “I don’t think I’m going to make it” from several people. But we all made it! There were 6 of us total, plus Bacon, who led us all the whole way. In all reality, if you ever get a chance to do this, I highly recommend it. 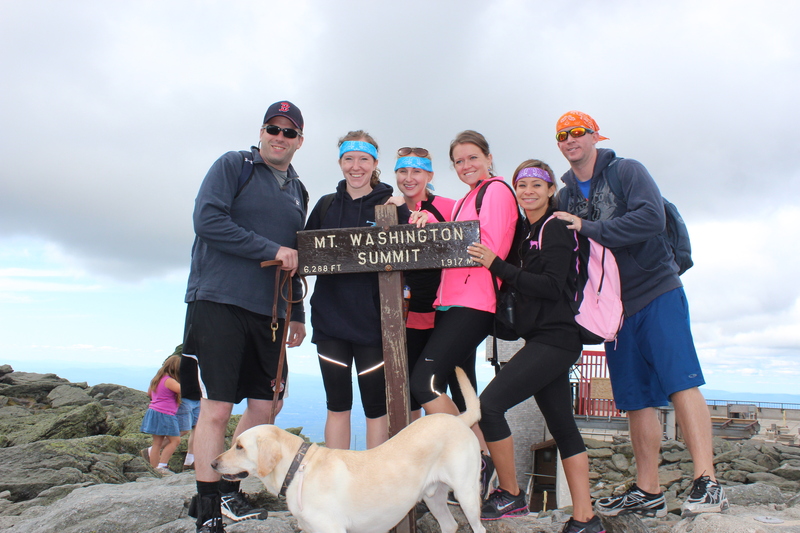 So congrats to Jeff and Christina, our florida pioneers, who came from one of the flattest states in the US, to conquering Mount Washington, the highest point on the east coast! 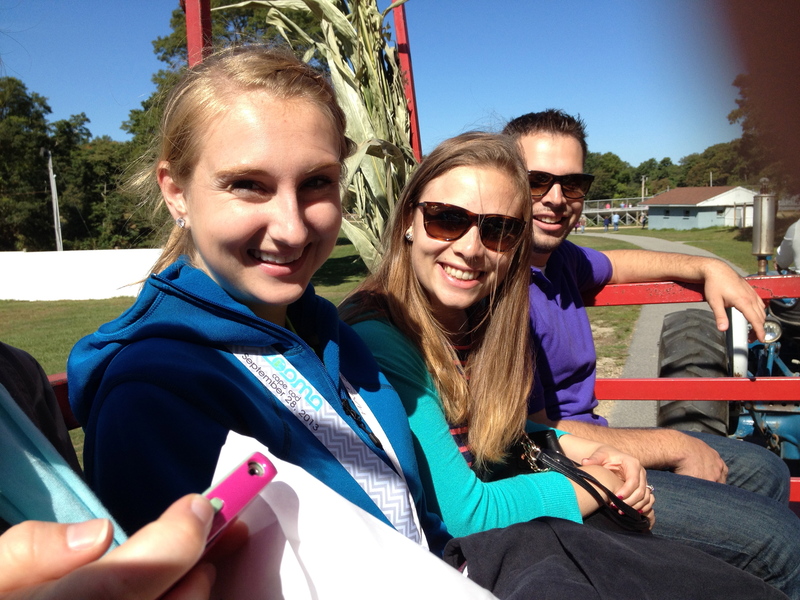 This entry was posted in Boston, The Bucket List, Try It! and tagged Boston, Cape Cod, Mount Washington, Road Trip on July 25, 2012 by Sizzle Food.